A woman's head explodes from technology overload in a humorous stock photo. Have you ever felt overloaded by technology? Well, I feel that way a couple of times a day! Sometimes I feel like my head is going to explode from it all. If I am feeling that way, then others are too…and that means fertile ground for a stock photo…a surprised woman with her head exploding from technology overload. 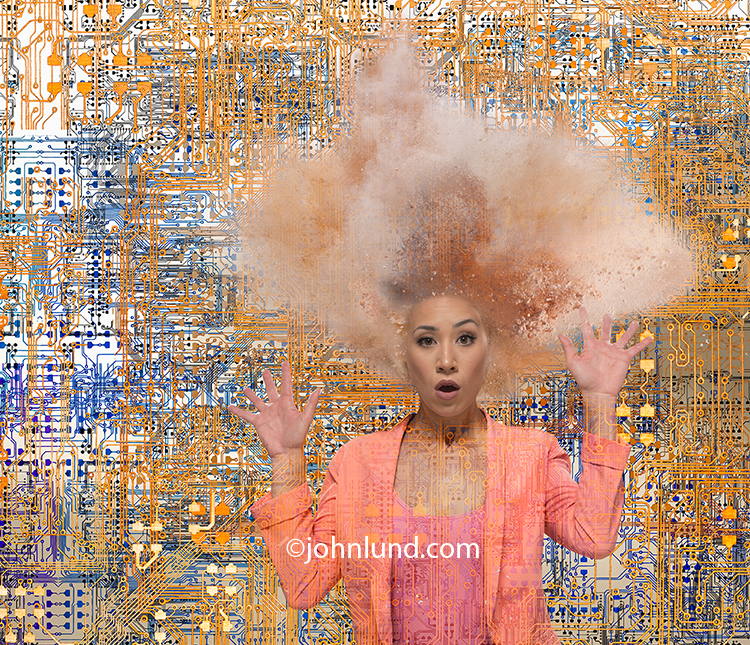 To create this technology overload stock photo I turned to a previous shoot I did to create a humorous head exploding from social media stock image. I used one of the out takes of the model with an expression surprise. I also turned to my archives to find a suitable “explosion” image…in this case a pile of face powder being hit with a burst of canned air. The final raw material image was a close-up, or more accurately several close up images of the computer circuitry traces on a motherboard. I combined the circuitry images, stripping out the traces, to create a very complex set of circuits with varying colors and brightness to add a sense of complexity and depth. 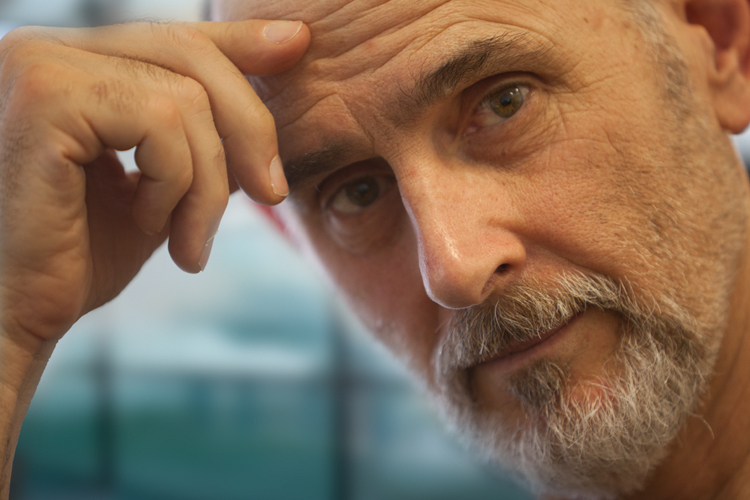 I wanted the circuitry to be unusually complex to add to the sense of overwhelming technology. I used a white to gray gradation as a background. I then dropped in the face powder “explosion”, and finally, added the woman’s face using a layer mask to fade her head into the explosion. The final steps were to add a bit more of the circuitry on top of her and adding a layer mask and “painting” out the circuits from her face. By adding the additional layer of circuitry on top of the woman we further “enmesh” her in the technology boosting the idea of the overwhelming nature of her situation. The image was composed to allow for easy cropping to any format be it square, horizontal or vertical. Finally I chose to distribute this image through Getty Images as a Royalty Free image (whoever came up with the name Royalty Free…jeez). Thanks for the post, Clipping path services are there to give your pic more beautiful look and these kind of services are very affordable to hire. Wow nice post. Amazing concept. This looks so creative and divine. I just wonder how the photographer get this kind of creative ideas. The picture is outstanding.Our clipping path service can make tour picture more attractive. Nice pictures.To get your photo edited you can also use clipping path service at the best price from clippingpathquick.com. Thanks for sharing fabulous information. Very helpful articles.